Posted on Fri, Nov 25, 2011 : 1:33 p.m.
Three things to watch Sunday when the Michigan State basketball team takes on Eastern Michigan at the Convocation Center (noon, ESPNU). 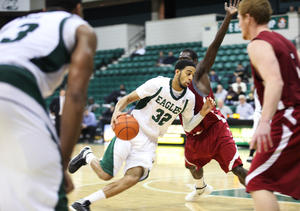 Jamell Harris (32) averages 7.4 rebounds a game for Eastern Michigan. 1. Can Darrell Lampley keep it going? Lampley, a senior guard for Eastern, was named the Mid-American Conference Player of the Week on Monday after scoring 21 points in a 62-51 victory against Arkansas-Little Rock. Lampley has led Eastern in scoring in three of its five games and is averaging 15 points and 3.4 assists per game. 2. Can Jamell Harris hold his own against a Big Ten team? Harris, a junior forward, averages 7.4 rebounds a game and leads Eastern with five blocks. He had 72 blocks as a sophomore, the fourth-best total in school history. 3. Does Eastern have a better record than Michigan State after the game? Eastern enters 4-1 and the Spartans are 3-2. The answer to the question is not as automatic as you might think. Michigan State has lost its last two games at Eastern, although those losses did come in 1987 and 1975. Tickets cost $15 to $20 and are available at EMUEagles.com. Two upper-bowl tickets to the game for $15 is also today's AnnArbor.com Real Deal. Sat, Nov 26, 2011 : 2:19 p.m. Sat, Nov 26, 2011 : 11:49 a.m.
Eastern doesn't have a chance against the Spartans. Michigan State has the best players money can buy!!! MSU's players are there to rehearse for million dollar jobs that the NBA provides while as the EMU players are there to get an education.